A lot of people are turning to the music industry to make a remunerative career. While some folks prefer to be a drummer, others are interested in playing a flute. However, there is growing craze among music enthusiasts to become a guitarist. If you are one of these folks, you may want to have a quality effects pedal such as the Dunlop 95Q for your guitar. The following Dunlop 95Q review will tell you why this wah pedal is really important for any guitarist. The Dunlop 95Q is essentially an original wah with some exceptional features in a metal case. You will find a plastic battery plate at the bottom. 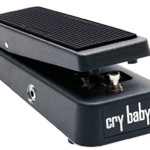 The wah pedal includes a jack plate that makes a snap for putting the battery in. Batteries run for a long time even when you unplug the guitar cable when not in use. You can also use a pedal board power supply or a 9V adaptor for powering the pedal. By adjusting volume and tone, you can create from really soft to more aggressive sounds for rocking out in the wah style. Available in a sleek design and robust-built, the 95Q is a durable pedal to serve you longer. With little care, you can enjoy its services for a long time without any issue. Dunlop is well known for offering various new and extra features in every wah pedal. The 95Q is not an exception to this Dunlop’s trait. One of the most intriguing features of the 95Q is the volume boost knob. It allows you to boost the volume up to about +15DB. You could just add a touch to make the wah effect more efficient and pronounced. You may also use the volume boost knob to max it out to make your wah solos scream. There is a button on the pedal to turn the volume off or on as you like while playing the guitar. This allows you more flexibility of volume enhancement when you are live in action. However, you need to check the wah because the boost could easily get turned on in transit. The Q dial allows you to choose the tonal range of wah’s sweep. It is possible to select from a bass heavy wah tone to a biting, treble tone. Although the Q dial first appeared on the 535Q pedal, it has been modified for betterment for the 95Q. You may choose the right tonal range for your preferences and customize the unit for different guitars and pickups. This is extremely handy for any guitarist when performing. Just like the volume boost dial, the Q dial is smooth and small. While this can be a hassle for someone with big fingers, it is easy to set and forget. The auto engage feature is a striking addition that makes the 95Q really unique from other wah pedals. As soon as you step on the pedal, the 95Q wah effect comes on. When you take the foot off, the pedal returns to the bass position and the wah effect gets turned off after a slight delay. This delay lets you rock the pedal without the pedal shutting off automatically when it is in the bass position. Although the switching is really silent, you will notice a change in tone as you move from bass wah to a usual guitar tone. The switching mode, though silent, might be irritating for some guitarists, but it is really subtle and doesn’t get noticed during live playing. 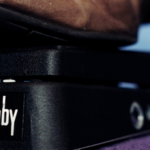 Above all, the 95Q wah pedal is sensibly priced to suit the wallet of all. Guitar professionals could be highly opinionated about wah tones. The Jim Dunlop wah pedals 95Q recognizes this point and allows you the opportunity to dial up the tunes you prefer. The pedal also lets you get the same tone with different guitars and pickups. The auto engage feature of the pedal is extremely useful for live playing. Volume boost is present if you want it; you can switch it off if you don’t need it. 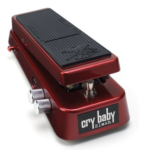 With so many appealing features outlined in the above Dunlop 95Q review, it is no surprise why this wah pedal is getting more and more popular among guitar players. 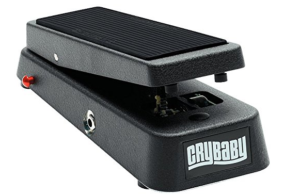 Dunlop GCB95 Original Crybaby Wah Pedal Review - Best Wah For Funk?